Thanks to Facebook’s “On This Day” feature, I was able to see that it’s been a year since I dyed my chocolatey locks bright pink. The bubble gum colouring has become such a part of me that I was surprised it had only been that long. I took some time today to reflect on how having pink hair changed my biz for the better, and thought I’d share the lessons with you. I know this may sound obvious, but I can’t tell you how many women I know struggle with visibility and showing up fully. I get it – I was one of them. My introverted heart would post eagerly, happily and helpfully, but I wasn’t sharing my story or journey, trying to keep things all professional. At networking events, I was a total wallflower, blended in, zero impact. I actually had a woman I met 3x say to me “It’s so nice to finally meet you.” the first time our paths crossed after my hair was pink. It can be hard to stand out, at events, and certainly in the online space, and my pink locks help me do that. I didn’t dye my hair as a gimmick, but it certainly didn’t hurt. This visibility has lead to my highest year of revenue, and the pink hair pulled me out of my shell. If you’re used to blending in, it’s time to flex the visibility muscle and learn to stand out. It’s entirely okay for you to be memorable. You Are An Extension Of Your Brand. Be Yourself. Your Tribe Will Find You. If you made a big change and your peeps are suddenly wigged out, they may not be the right peeps, and that’s A-OK. As you change and refine, your business and your dream clients will change and refine along with you. I was SO SCARED of alienating my peeps that I held off making the change for a super long time. It wasn’t until I polled my audience to find out that not only would they be able to take me seriously as a creative professional with pink hair, but they thought it showed balls and confidence. So my fear that I’d lose all my street cred was totally unfounded. 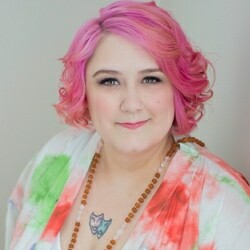 I’ve made more connections, gotten better clients, and am working in a more aligned way… and it all started with a bottle of pink dye.